There are 2 Walk for Wishes events in Arizona (1 in Phoenix and 1 in Tucson) this year. Please make sure that you are signed up for the correct one if you are only going to do one event. I will be coordinating for both. This is the 4th year of our participation in the Walk for Wishes. This is the 2nd Year of the Walk for Wishes in Tucson!!!! Last year we had 3 troopers and made a huge splash. Let's blow their blast doors off this year! As we have done previously for the Walk in Phoenix, we will have some people (myself included) participating in the Walk. We may also have a designated spot for any troopers who just wish to cheer on and take pictures with the walkers and runners. I have created a team called "AZ Star Wars Groups" for the fundraising campaign (see details below). NOTE: Registration with the team is not necessary to Walk or Cheer, although it is free. All of the costuming groups are invited to join and/or participate. Do not worry if you need to leave a little early. Changing Room: This will be a parking lot change. Water: Will be provided. I will have a cooler with water and gatorade. Weapons: NO. This includes blasters, lightsabers, gaffis, et al. Point of Contact: Me (Tim Wiant, "Echo", "Fives", "Sixes", big blue handprint dude). My cell phone is 480-220-5725. Email is wiant@engineer.com. Send any and all questions, comments and concerns my direction. Parking: Garage on north side of UA campus at E 2nd St and N Highland Ave.
Ok be sure to let Tim know you'll be in attendance for this one so he can keep you in the loop! Will do. I already emailed him and gave him my phone number. 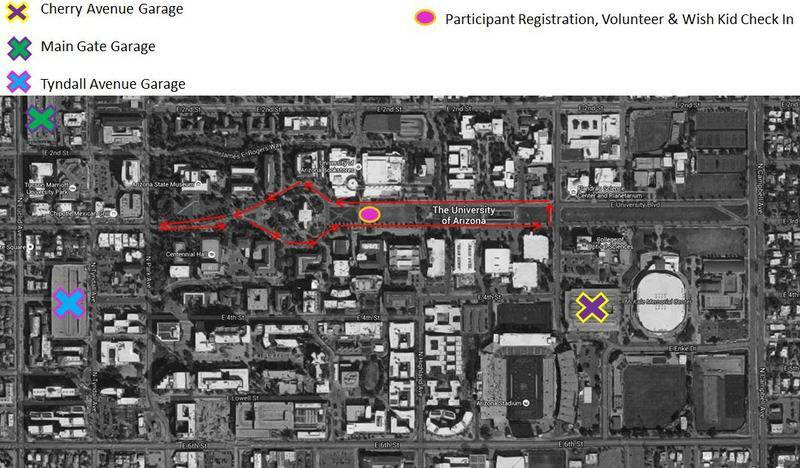 Here is the map of the course for the walk. The garages marked with X's are supposed to be free. I will be parking in the 2nd St garage (directly north of registration) due to its proximity to the activities.